Posted 10.11.2016 at 07:11 in blog by admin / Comments Off on What should I do if I get a blow on my front teeth? Enamel makes up the outermost, irreparable and hardest layer of human teeth but sudden blow or impact force and biting hard food stuff and objects can fracture or chip it off leading to handicapped structure, function and esthetics. Severe blows during sports in the playground especially in young children and teenagers may lead to knocking out of teeth as a whole from the bony sockets. Special management is warranted immediately in order to save the viability of nerves of teeth for the preservation of natural tooth structure and functions. Albuquerque New Mexico 24 hours emergency specialist cosmetic & restorative dentist Dr William C Gardner at NM Family and Cosmetic Dentistry PC thoroughly guides and advises his patients regarding the necessary steps taken at home before visiting the dental health care professionals for permanent treatment of the condition. Q. WHICH INSTRUCTIONS SHOULD I FOLLOW IN CASE OF CHIPPED OFF, KNOCKED OUT OR TRAUMATIZED FRONT TEETH? • Rinse your mouth with warm water. Q. WHAT SHOULD BE THE IMMEDIATE STEPS OF MANAGEMENT? Call your emergency dentist for further instructions and booking an appointment for the long term definitive management of damaged tooth. Q. WHAT SHOULD BE DONE IF ONLY SMALL FRAGMENT OF THE WHOLE TOOTH GETS CHIPPED OFF OR BREAKS? A. 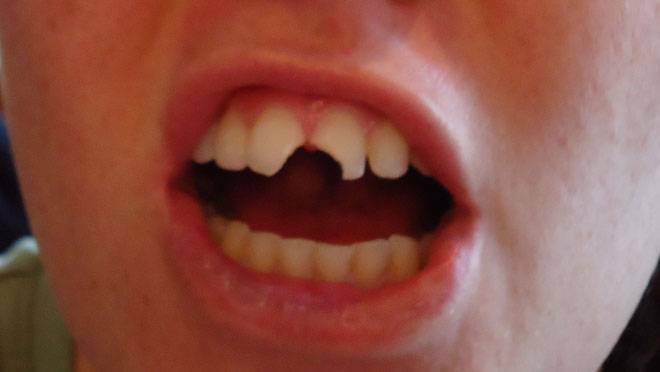 Broken and chipped tooth parts gets good treatment in the dental office. Broken portions is safe in the above-mentioned media and brought to the dental clinic. Specially manufactured dental materials are in use at the dental health care clinic and professionals. This is for re-attachment of these tooth parts for the restoration of structure. It is also for function and natural looks of the teeth for producing beautiful smiles.